Holding “Direct Connection” and “Close Contact” as a keyword of TouhokuHELP, we aided those who gave out relief aid, as “Church Activity”. In the midst of earthquake disaster our eyes were opened and we understood that “there were things a church could do”. This became possible by the special characteristic “Direct Connection” and “Close Contact” a church has. A church has a close contact in the region, and at the same time, a church also is directly connected with other churches all over the country, and in the whole world. “Activating in the local by thinking global”, is a catchword World Council of Churches upholds, and without knowing them we were practicing them. When we came into our senses, we were amazed at its great value, and encouraged each other with these words, “There are things a church could do”. Now, the disaster afflicted area is bifurcated. One of them is a Tsunami afflicted areas which has “reconstruction” as a keyword. The other is an area which was exposed to radiation, and has “Insecurity” as a keyword. These two places are geographically overlaps each other, so it will never be completely separated. However, since the path of these two problems to solve lies completely in a different direction, it cannot be easily linked together. Here is one hidden difficulty. 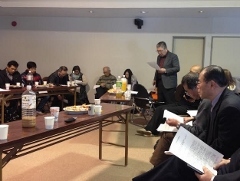 In these circumstances, “Disaster Afflicted Four Prefecture Liaison Committee” was held in Sendai Baptist Theological School on February 10th. Though understanding the necessity of assembling together, this gathering was summoned as we groped around for its purpose. However, this gathering opened a way for a breakthrough to the above mentioned issue. This gathering was summoned by Rev. Eiji Sumiyoshi (Japan Alliance Christ Church Nakoso Gospel Christ Church). Director Tatsuo Nakazawa and Kawakami were the ones who participated from TouhokuHELP. Unfortunately many participants from Aomori and Ibaragi were not able to arrive in Sendai because of snow. However, people gathered from Morioka, Kesennuma, and Yamagata. Rev.Koichi Otomo (Shiogama Bible Baptist Church) took the leadership. We talked about, and encouraged each other of the deeds of love church were devoting in, together with the local people, for the local people, and being loved by the local people. However when we discussed about the reality of Fukushima, we felt a dreary atmosphere, as if a heavy atmosphere bended over us. Rev. Takuo Takahashi (Mission Tohoku / Aizu Bible Church) and Rev. Seizo Kasai (Haramachi Christ Gospel Church) gave us a report on Aizu. This report spoke to us about the reality of obscurity and the present state of unclear prospects. Many people who gathered there then said, “Let’s go to Fukushima and worship together, in order to experience the reality”. That is how it was decided that day that we will again come together on June 17th. In Aizu we listened to the lecture of Mr. Shinpei Murakami who cultivates a new field away from the Radiation Exposed area. He recalled the incident of Lot’s family escaping from Sodom and Gomorrah while he was in the evacuation shelters, and the word of Jesus saying “do not worry” resounded in his heart. Then amazingly he felt comfortable of not returning back to his former land. That is how he was able to elude despair, and this story left an impression in our minds. That night, TouhokuHELP’ board of directors were summoned. After the report of clerical stuff and discussion, a debate started on how to think of “Evangelizing”. The conclusion of its summary is as follows. (1) We understand that our “mission” is disaster relief activity. (2) The core of the meaning “mission” is “missio = sending”. (3) Thinking about the character of “The Sender”, and the current situation of “the destination we’re sent”, we have confirmed that gospel is invaluable and definitely necessary at the disaster afflicted area / radiation exposed area. (4) In order to be united for “the mission of relief activity”, we need to examine the redefinition of gospel. A definition is that “God loves this world”. (5) In this definition, the main focus is on the word “this” in the word “this world”. “This world” includes the “division and dispute which are frequently exposed in the reconstruction process, the reality of obscure situation of exposure to radiation, and all the evil that is found surrounding these things. (7) TouhokuHELP will undertake this task of mission and evangelizing in view of the things mentioned above. We bring the fruit that is produced out of this ground, and aim to contribute to all Christian relief worker. 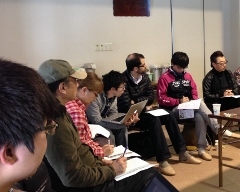 The next day after confirming the above with thanksgiving, Kawakami set out to Nagoya for the “Sister Church Project”, and received an opportunity to report of the church’s work in the disaster afflicted area to the various churches in Nagoya City and Nisshin City. It was a great time to reconfirm the “Things churches could do” by visiting United Church of Christ in Japan Nagoya Central Church , Jesus Christ Church in Japan Nagoya Church, United Church of Christ in Japan Minamiyama Church, The Reformed Church in Japan Nagoya Iwanoue Missionary Station, Japan Evangelical Lutheran Church, and Nagoya Christian Liaison Committee. 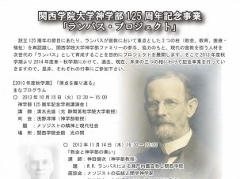 The day after that, on the 13th, Kawakami arrived in Kobe, and participated in the Kwansei Gakuin University School of Theologies’ Theology Seminar. This was the seminar to debate on “Evangelism” in keeping The 10th WCC Busan Convention in mind. There, we were given opportunity to understand the WCC statement together titled, “Together Towards Life: Mission and Evangelism in Changing Landscapes”. What was amazing was that in this statement, they were the exact TouhokuHELP Mission and Evangelism understating we have previously confirmed. The following things are especially important. b. Churches are called to actively convey God’s gospel which saves the world. c. Churches live in a world with various religions, culture, and technology. d. Churches are a gift from God to heal and to reconcile the world. a. God’s Spirit started in this world, ad was covering the world. b. God’s Spirit filled Mary, and led her to the birth of our Lord. c. God’s Spirit filled the entire life of our Lord Jesus. d. God’s Spirit was sent by our Lord Jesus who resurrected. f. We take part in God’s Spirit’ mission of love. a. This God’s Spirit starts the building of God’s kingdom from the marginalized and fringed people and places. This was seen also in the entire life of Jesus. b. This God’s Spirit is working to heal the pain of the whole world. d. By participating in God’s Spirit’ mission of love, churches activate. e. This God’s Spirit blesses the church as it unites under diversity. f. Regardless to Church’ unity, each church’ individuality is blessed. g. The occurrence in each church’ individuality itself is a pointer to lead in general. h. Testimony indeed is the core of preaching the gospel. It overflows God’s love from the heart. i. Conversion principle is not justified in modern days. Conversion is the work of God. j. Preaching the gospel is done from individual to individual, and produces repentance. k. There are various ways to preach the gospel. To approach for individual repentance, and those that do not do so, both are equally respected. l. Churches which resides in various religion should consider the following matters. I. Reject all violent measure. II. Harmony with all people who seek Justice and Peace. III. Respect all humanity and their culture. (By distinguishing all segregationalism). V. Keep on ensuring freedom. VI. Establish a relationship to mutually understand people of different religion and Atheist. These statements were created together by Evangelical Church, Pentecostal Church, and Charismatic Church which WCC invited. There it has been revealed what kind of role a church has in the world Gods is at work. We learned that “We should not hinder what God does”, from what Rev. Hiroshi Minagishi (Kesennuma Daiichi Baptist Church) spoke. The churches in the disaster afflicted areas are in experiment period in regards to further movement. Confident that this statement concerning mission / evangelism will surely be of use at the disaster afflicted area, I called Rev. Kazuyuki Otomo (Shiogama Bible Baptist church) at once. I asked him to let me share what I learned at the next “Four Prefecture Liaison Committee” which had been planned to be held in June. Above written were what Kawakami was working on this week. It connected the world’s discussion with the disaster afflicted area, in order to compare the world with the current situation of disaster afflicted area. “Direct Connection and Close Contact”, this advantage of the church will be thus visualized. I have given this report with much appreciation to all.